Claire is a Peckham based swimwear designer and maker (stidstonswimwear.com) and Sophie is a retail buyer at Frame. Friends since meeting during Manchester University Fresher’s week 9 years ago, and after a few years dotted around South London, we have both found our home in Peckham & have loved watching so many of the regeneration projects come to fruition. ‘Flock’ is a vibrant edit of local and loved independent brands, has been a long-running concept, with Peckham a hotbed of creativity and art, the main aim is to offer local entrepreneurs & brands in the area a curated physical platform to showcase their work. 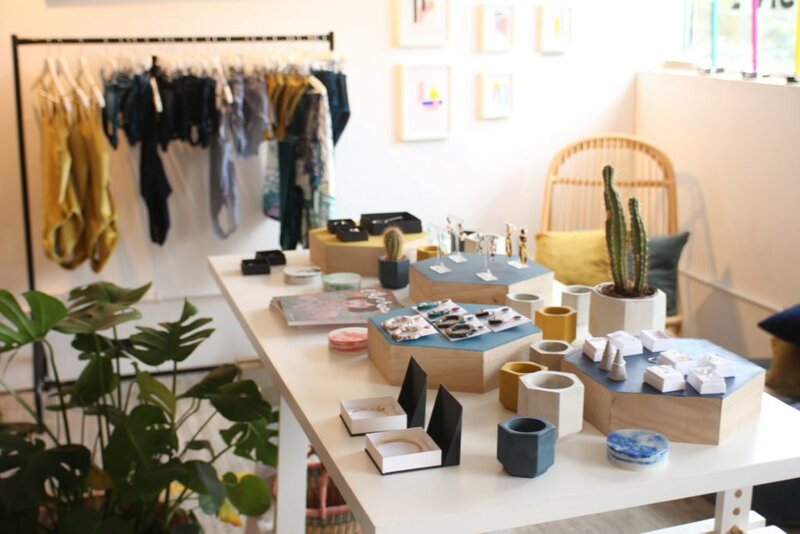 We have several Peckham based brands and artists including Nomadic People, Katrina Russell-Adams, JDP Ceramics, Hannah Toe-hill, The Pattern Guild, Phoebe Thompson Jewellery, Joe Cook Photography, Messe Jesse and Stidston Swimwear. Many of these brands and artists will be showcasing their work as part of the festival anyway, but Flock provides the opportunity of involvement for those that wont be and will create a hub where visitors of the studio can access a curated collection and discover new brands.